I had a lot of fun recently playing with Crosswalk. I was basically testing it’s features and extensions when it hit me: I know it’s possible to write Native extensions for crosswalk Tizen, but is it possible to write Native Extensions for Crosswalk-android? How would it behave? Crosswalk android already provides a way to load Java extensions, and the Android-NDK provides a way to call a native library from a Java method. We just have to glue those things together. I won’t talk here about how to build a library with NDK or how to write a regular extension with Crosswalk, as those topics are already extensively covered over the Internet. I assume you already have an library.so and a working crosswalk-android extension from the Tutorials. Crosswalk-samples includes an example application named “extensions-android“. This application builds the extension code first using an “ant” recipe and then builds the html application itself and put both inside an apk file. By the end of the extension build process, the ant recipe opens the extension.jar file to include the META-INF information inside that file. It’s the perfect time to inject our native library inside the package. We only have to change the build.xml recipe to include the library. Be sure to do it between <unjar> and <jar> as we’re taking advantage of the fact that the extension jar is being opened and closed to include the META-INF. Converting it to JAVA or C would be ridiculous easy. OK, It’s a bit odd, the loading time is different from execution to execution and it affects the first time the code is executed. Ignoring the higher (usually the first execution) and lower values (got lucky?) 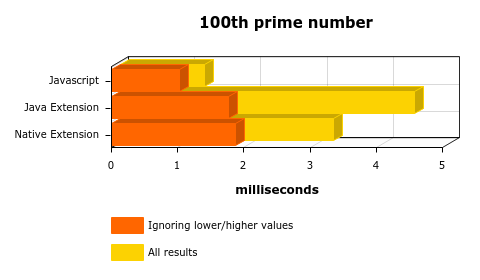 give us a more sane result, but still… What about the 10Kth prime number? 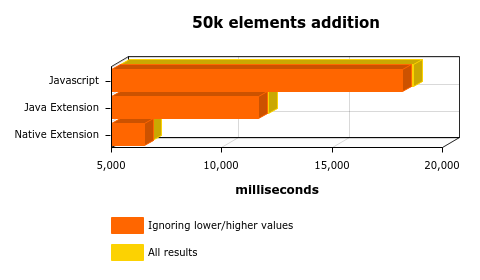 It doesn’t make any sense, JS is faster?! What’s going on? It happens that Modulus operation can be improved, and I believe that the V8 is smart enough to use some of those techniques. 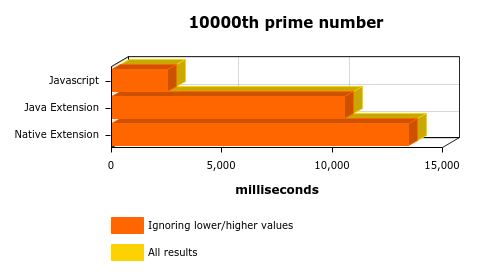 So, looking for primes might not be a fair way to measure performance. A second approach would be to avoid divisions and use only plain additions. Maybe just sum the sequence 1+2..+N, repeating it N times? Maybe 1-2+3-4…N to avoid overflow? As the final value is -n/2, I’m starting the sum with n/2 to get 0 as the result. 1 – The cost of going from JS->JAVA or JS->JAVA->C cannot be ignored. 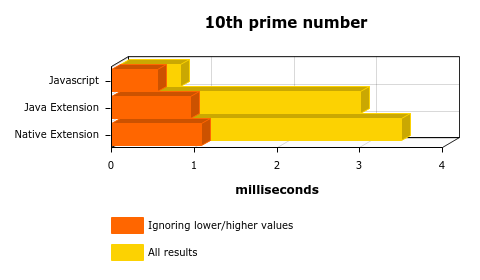 It was a bit less than 1ms (from the 10 additions chart). Think about that before putting a native call inside a huge loop. 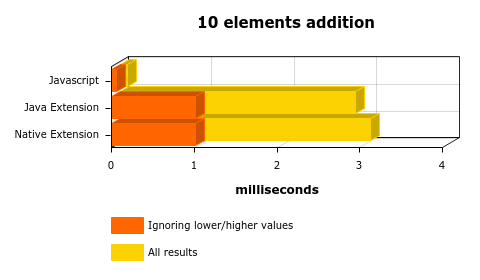 2 – Consider measuring your optimizations before accepting it in your source code. Sometimes things are not obvious. Hacked version of crosswalk-examples repository. Post a comment — Trackback URI RSS 2.0 feed for these comments This entry (permalink) was posted on Thursday, February 5, 2015, at 1:06 pm by Danilo Cesar. Filed in Android, Crosswalk, Linux and tagged android, crosswalk, performance.